The Ambivalent Nature of Urban Borders: Martyrs’ Square in Beirut. Beirut is a multi-layered, dynamic and extremely contested city, which boomed in the early twentieth century to become one of the region’s complex urban environments where both memorabilia of the war and the resistance to neoliberal regeneration defy the oblivion of the past and the future. A couple of decades after the bloody civil war which broke the city in two along a harsh line, the neighborhoods of Beirut still find themselves highly segregated, usually based on residents’ socioeconomic status, and quite often dominated by religious or political ‘enthusiasts’ place-politics, securitizing the streets and signifying their presence with localities, photos of politicians, and flags and banners across buildings and street vendors. 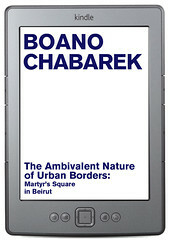 This book is an examinations about Martyrs’ Square in Beirut and its role as in intra-urban border. This is the first e-Book of dpr-barcelona's series Emancipatory Space, about politics, economy, law and architecture. This series of e-books intend to spread texts that challenge conventional relations of such subjects. As the Ignorant Schoolmaster, the authors in this series propose ideas that moves outside their academic framework, often subjected to a slower and restricted publishing ratio. With this emancipatory attitude, instigating to decolonize the mind from learned frameworks, instruction becomes freedom: something which is not taught but claims to be taken. In the Emancipatory Space, equality is not an end... it is the very starting point.